Home » Entertainment » Exceeding Wow, Beyond Awesome.... Here Comes the Light Hearted Super Hero Shazam! Combine Harry Potter and the Greatest American Hero and you soar past wow, above awesome..it's Shazam ! Translation: Warner Bros. introduction of the split super hero (Captain Marvel /Shazam historically one whimsical superhero in 40s Golden Age comics) wisely exemplifies humor with a teen hero (Peter Parker meets Gremlins?) who's determined to have a "pure" heart when gifted by a wizard with a set of super powers. They don't come with an instruction manual just a mandatory latex costume and boots. A swiftly crafted flashback and streamlined intros have a clueless grown Billy Batson experimenting , celebrating and battling a gargoyle demon villain who wants his powers. Anyone that remembers TV's Greatest American Hero (a Superman spoof) recalls him learning to fly. Poor Shazam . He's rattling confidence phrases to trigger courage to leap, jump, and maybe fly. 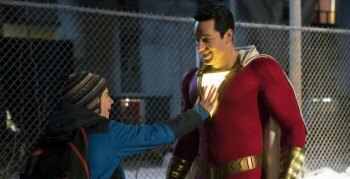 The genius of "Shazam" results from fourteen year old Billy (Asher Angel )living in a group home and with a clash of lightening turning into an high pitch voiced adult (Zachary Levi) in a red and yellow costume. He first selfishly seizes the opportunity for satisfying normal people and paparazzi focusing on his hero status. 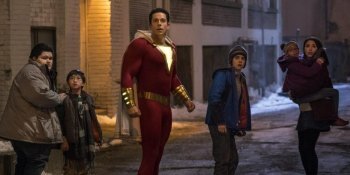 David (Light's Out) Sandberg directs a half-campy, half "what would you do with your super powers" production where the super dude has a chiseled body of a 30 year old man but the mind and emotions of a teen (like Tom Hanks in "Big") . When not thrusting lightning bolts, he stops a robbery by encouraging the thugs to keep shooting him, buys beer sans ID, catches a bus that plummeted off a bridge, and slips into an adult club before having to face the envious Dr. Thaddeus Sivana (Mark Strong II) who wants his powers. Forget all the D.C. dark gray moodiness, Shazam! is feel good entertainment that's more heart than Zap. Young Billy does not brood about world affairs, he's still avoiding bullies , facing virtually lonely lunch rooms, and passing algebra tests. 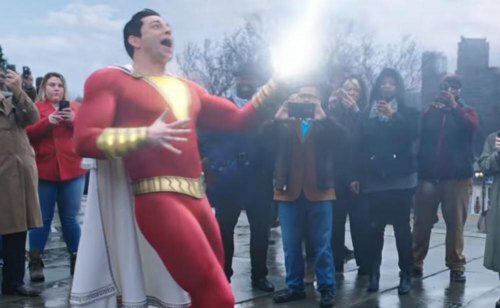 Having received his powers from a dying wizard, they came without an instructions so Shazam's best scenes have him "testing" his gifts. atter portion pits him in one on one's with Dr. Sivana. 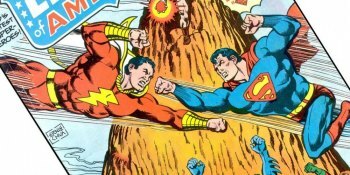 Briefly scanning listings of the genre unveils no on point Shazam! predecessors. Campy "Batman" and "Captain Nice" have too much cheese, early TV series (Superman, Wonder Woman) are heavily drama influenced. The filmmakers have juggled multiple mindsets into seamless smiling and laughing naturally coupled with novel twists and light good guys always win mandates. Don't put this one off. It's a big screen hoot. You have to be Shazamed before you will appreciate what I'm writing.